One day, it happened on the way back from the dog run. Anna stopped in the crowded hospital hallway, wagged her tail, and brought her handler’s attention to a small child and her family. The Rev. Lindsay Bona, Anna’s handler and the manager of Michigan Medicine’s Spiritual Care Department, knew immediately that Anna needed to say hello. After inviting the 3-year-old golden retriever over, the child’s parents explained that they could all use some extra care; they had just checked their daughter in for treatment. Anna with a gift from a special patient. That preternatural talent is why Anna — named, like the rest of her litter, after Frozen characters — is one of two full-time therapy dogs at Michigan Medicine. 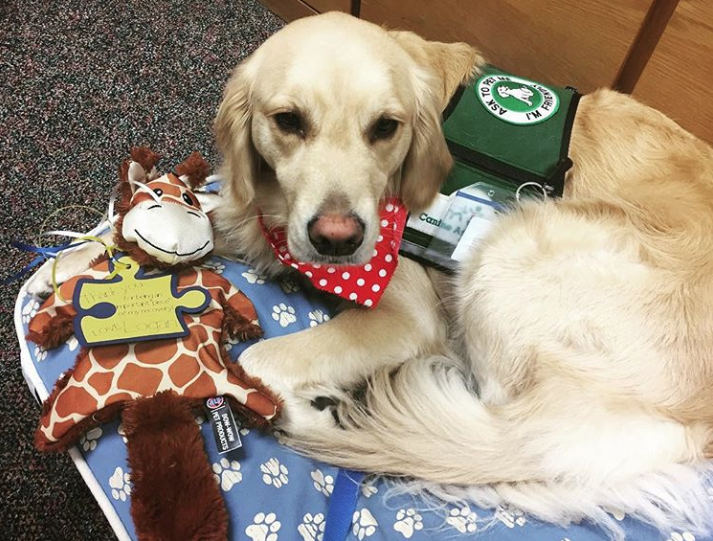 For the past two years, she and her canine co-worker, Denver (whose handler, Joel Maier, is a certified child and family life specialist at C.S. Mott Children’s Hospital), have been warming hearts, dispelling stress, and offering much-appreciated companionship. 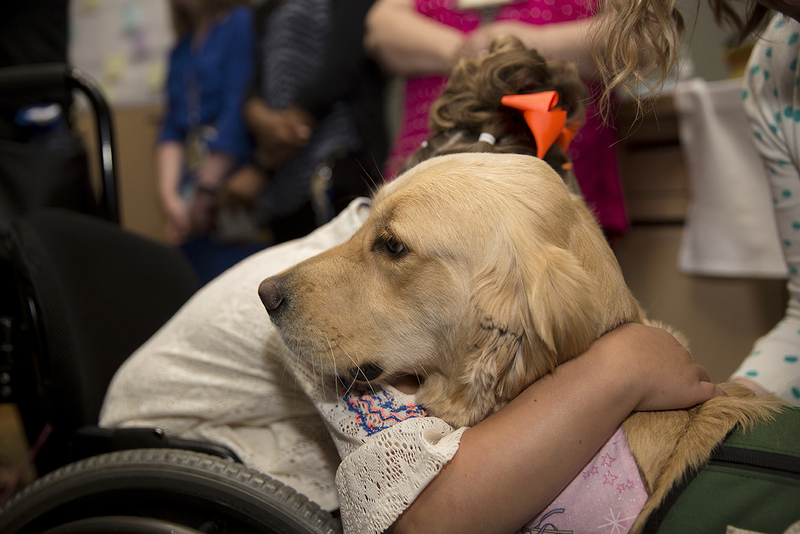 Since 1987, Michigan Medicine worked with Therapaws of Michigan to bring in comfort animals on volunteer bases. After it became clear that patients, families, faculty, and even staff benefited from the interactions, however, the thinking started to shift: Perhaps it would be advantageous to have dogs on hospital grounds every day — as “employees,” so to speak. Thus, with help from the Laurence Polatsch Memorial Fund, the hospital’s bespoke animal therapy program was born and named Paws4Patients. That’s why Bona, also manager of Paws4Patients, builds in a 15-minute cushion around all of her appointments and meetings. Sometimes, Anna will meet someone she needs to comfort, and Bona — because of the special bond they share — understands that their immediate to-do list has to be put on hold for a little while. 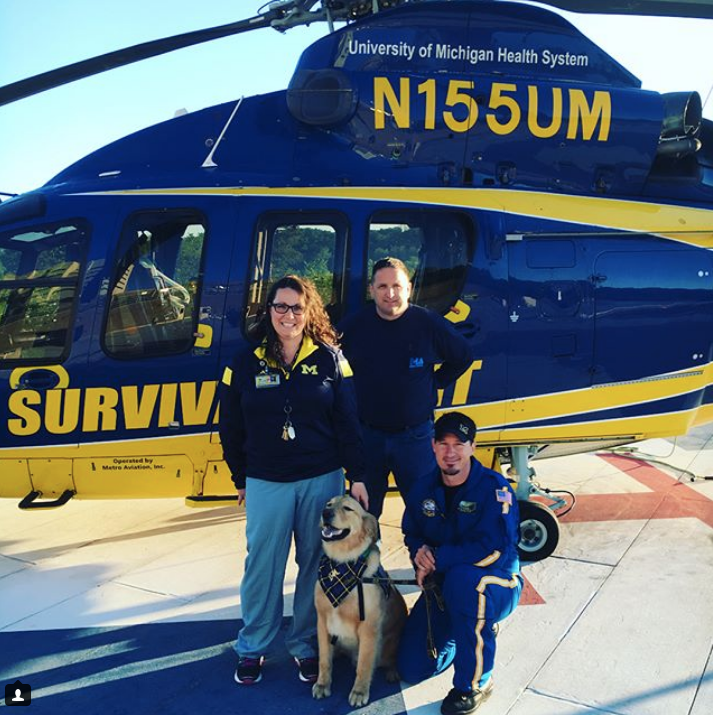 Denver hangs out with some Survival Flight crewmembers. A quick but meaningful visit often turns a difficult day into something very special. Besides lowering blood pressure and reducing anxiety, dogs have a way of teasing out things caregivers and even family might not be able to, Bona says. With Anna’s help, she has seen patients begin to think — and react — in completely new ways. Bona is aware that what Anna and Denver evoke is something unique. When they walk into a room, there’s no pressure, no unease, no uncertainty; they're just two cuddly pups looking to make new friends. What they provide that’s so special is a part of themselves: a “wonderful, wonderful giving” of love. To learn more about Anna and Denver — and see their everyday adventures — visit the Paws4Patients Instagram page, or read about animal therapy at Michigan Medicine.